Traditional schoolyard bullying has escalated to hiding behind a computer and posting cruel or hurtful photos and messages. 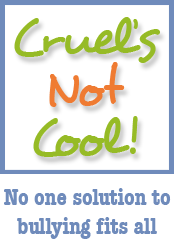 Simply put, cyberbullying is bullying someone either online or by cell phone. Face-to-face harassment at school continues 24/7 in cyberspace where the effects are long-lasting and often tragic. 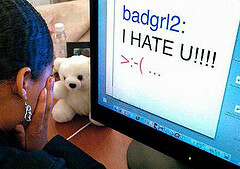 Cyberbullying has become a global problem contributing, in some cases, to suicide. The bullies think they’re anonymous because they’re alone in their bedroom with no witnesses present. However, the Internet never forgets and through tracking systems, the computer or cell phone used to bully can be identified, as well as the sender in many cases. Not only have cyberbullies been disciplined at school, but in some instances, criminal charges have been brought or civil lawsuits filed against the teenager and parents. Students have been suspended, expelled, arrested and detained as a result of their online and cell phone activities. Due to mean and thoughtless emails, texts, blogs, Facebook and YouTube entries, many teens and their parents have paid a heavy price for not thinking before clicking. We also recommend an app titled Professor Garfield’s Cyberbullying. It’s free on iTunes and for ages 4 and up. It includes tips on recognizing different forms of cyberbullying, strategies for dealing with bullies, and the importance of telling an adult. Listen to Judge Tom discuss cyberbullying prevention tips on the CyberHood Watch podcast. Also, take a look at Teen Cyberbullying Investigated (January 2010) for real cases of teens in trouble over their online and cell phone activities. “You’re not strong by putting other people down–you’re strong by lifting them up.” President Barack Obama, who further stated that “We’ve got to dispel this myth that bullying is just a normal rite of passage. It’s not.” In April, 2012, President Obama took the opportunity to endorse two bills pending before Congress. The Student Non-Discrimination Act (HR-998) and the Safe Schools Improvement Act (HR 1648) will ensure that students are safe at school and can learn in environments free from bullying, harassment and discrimination. Hopefully, Congress will take a serious look at these bills and pass them into law. The White House also hosted a screening of the 2012 documentary “Bully” which we recommend to every parent, child and teenager. In a 2010 study from the Josephson Institute of Ethics in California, 50% of teens ages 15 to 18 reported they had bullied, teased or taunted someone at least once. 47% reported having been bullied in a way that seriously upset them. One hundred public and private schools participated in the survey involving 43,321 teens. Read more about this report here. For information about state laws about cyberbullying, take a look at Professors Justin Patchin and Sameer Hinduja’s research site: www.cyberbullying.us Many states have addressed this issue. For example, California passed a law that went into effect in January, 2011, authorizing schools to suspend students who use social networking sites to bully someone. This law is in the state’s Education Code.